In “A Job of Any Merit: Your 3 Options” I asked you to get personally involved in job creation. I asked you to share my essay, and talk about it, so with this post, we continue the conversation. The options we have now may not be that pretty, and they may not be easy to navigate, but giving up on them doesn’t make any sense. Let’s improve them. It is totally possible for a person to feel all 3 options apply to them, maybe now, maybe later. Let’s hō‘imi, and consider how a person may move through all 3 options a bit more purposefully. 1, 2, 3: Do all apply to you? Those who pick option 1 prefer to get employed for the obvious advantages, like a predictable paycheck (you can’t call it a ‘steady’ paycheck anymore). They may be looking for other benefits beyond compensation, even if they’re partial benefits, such as with medical insurance or 401k matching. They thrive in the social and cultural environment of a workplace you physically go to, and they want the opportunity to learn from their employer, and from an industry’s disciplines and network of partnerships. Being employed is still a great option, and it’s not going away totally — nor do we want it to. We want to improve jobs in movements like my own, with Managing with Aloha, and Business Thinking with Aloha. The current challenge people have in economies globally, is simply that the good jobs which represent worthwhile work are hard to find, and then secure. Thus, the person who prefers to get employed, may feel they’re forced into newly reckoning with option 2 as well; creating a job of their own. Compensation levels have been decreasing in new job vacancies, and securing employment, even full-time employment, may not be paying the bills. People find they need to earn more. Existing jobs (if they can get them) may pay them sustenance wise, but not so people can get out of debt, hone new skills, and grow toward developing additional income streams or championing other worthwhile causes. The point I hoped to make with option 2 in writing “A Job of Any Merit: Your 3 Options,” was that there is more possibility within that option beyond entrepreneurship: “Building my own business” is something which can intimidate us in its complexity and risk. We have to expand our vocabulary with this option, and thus, expand our opportunity. Who knows? You may move from feeling forced into this option, to actually starting to want it — in exploring this option, you’ve made the shift from the half-empty to half-full viewpoint. There are benefits here too; they’re just different ones. Option 3 presented a challenge: If you have a job of any kind at all, you have some degree of leverage, for that job represents an advantage. Now it is time to capitalize on what you have, build on it, and optimize it fully. Turn job into the work of your heart’s desire. Then pay it forward: Option 3 reminds us of the Golden Rule, and asks you to do for others as you would have them do for you. Don’t make any assumptions in prejudging others who are unemployed; just help them however you can (Did you read this post? “They know how to lead — and be led.”]. Prosperity is a concept of abundance, and we can share the wealth of work dignity freely, knowing that good begets more good. In doing so, we will never negate our own standing; we’ll strengthen it. So if two, or all three job options apply to you, choose your best stance, the one where you will start to concentrate your efforts. My coaching for you, is to focus on that context of merit within your available choices. Merit is the quality of being particularly good or worthy of your efforts. Taking action where the merit is, becomes the best way we leave the overwhelm, hand-wringing, and frustration of having no agenda behind us. Those who are starting to emerge as leaders within the Occupy Wall Street movement have recognized this: Public protest is largely a complaint, albeit one which has gotten chronic and cries to be better heard. But complaining only goes so far, and it irritates others along the way, diluting the message. To achieve any resolution we look to its root word, solution, and the leaders emerging have clearer voices: They are starting to articulate courses of definitive action beyond mere protest. 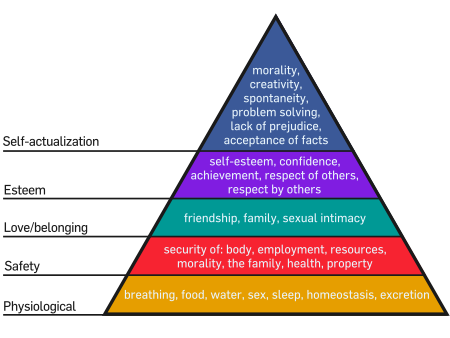 When we speak of moving forward, and making progress from where you are to where you can be, I see the “Job of Any Merit” options as a kind of ladder you climb, where you can eventually skim the cream of Maslow’s Pyramid up at the top (achieving self-actualization; see the pyramid graphic below). Option 1 is included in your plan because you want an insider’s view of the industry your idea relates to. You want the ‘real job/real work’ learning which exists there now in the present day, versus the academic learning you’ve done in school, or via books and such. In other words, why reinvent the wheel when it’s a perfectly decent, good wheel now? — start with it as savvy foundation, then improve upon it. Make it relevant to your idea, and tap into the advantages of workplace culture, and the leverage of industry networks while you’re there. I wrote Business Thinking with Aloha for this person in particular, to give them a framework for putting their learning into, versus taking the scattershot/happenstance approach. Intentional learning like this, whether from an industry-related job or by another means, helps you make important decisions about your future. You make those decisions based on a purpose which evolves (that purpose was probably driving your idea in the first place) but mostly because you have a steadily increasing bank of knowledge about it — you have more clarity. As we prefer saying in Managing with Aloha’s Alaka‘i style of managing, we don’t make decisions impulsively, we go about finding them: Can you see with your ears? Turn intentional learning into a deliberate habit, and it becomes a skill of acquired wisdom: It is skills mastery at its finest. Ideas are what will push you up the learning ladder, and up the pyramid of your own needs. There might be several paths you can take while you evaluate the merits of option 2, which was creating your own jobs, or collection of jobs, via entrepreneurship, freelancing, novel partnerships or other means. You sort out option 2 to develop additional income streams for yourself, each of which starts with another one of your ideas. “This one relates to outsourcing a service I can provide… this one relates to selling a product I’ve created” this one relates to a new relationship I’ve been cultivating with a possible partner”” etc. You begin to think about doing more creative work beyond anyone else’s definition of ‘job’ and in effect, you begin to break away from anyone else having to do it for you (that ‘middleman‘ I’ve referred to). In Managing with Aloha, this ongoing, lifetime sensibility with work creation, and with lifelong learning, is the value immersion of Ho‘ohana and ‘Imi ola. As I’ve explained, you may be in the Option 3 effort for yourself at first — for your own job improvement, or to help your own team, department, division or company: You’ll radiate your efforts by building on your successes and increasing both your advantages and your leverage — much like the ripples in a pond, you widen your embrace of partnerships, because now you can. In Managing with Aloha this is the “Language of we” in Kākou, the teaming synergies of Lōkahi, and the community outreach of ‘Ohana and Mālama. YOUR knowledge leverages YOUR ideas too. The knowledge economy is a term that refers either to an economy of knowledge focused on the production and management of knowledge in the frame of economic constraints, or to a knowledge-based economy. In the second meaning, more frequently used, it refers to the use of knowledge technologies (such as knowledge engineering and knowledge management) to produce economic benefits as well as job creation. The essential difference is that in a knowledge economy, knowledge is a product, while in a knowledge-based economy, knowledge is a tool. As a coach and a manager, I instinctively get drawn to that last phrase, that knowledge is a tool. Further, it’s a tool we all can have if only we choose to learn actively and not passively. I’ve mentioned Richard Florida (as author of The Great Reset, my review is here), because I’ve been studying his economic views connected to the urban movement, wherein we work toward applying more ‘metro benefits’ to the suburban sprawl created before the housing crisis imploded, as we’re now realizing it would inevitably do — this study is currently on my own ladder of learning, relevant to an idea I have, which is connected to the work I do. As I see it, we’ve all got to dig deeper, give ourselves more credit, and understand just how creative we are, and can always be. Creativity plays out one idea at a time, and you do have ideas, I know you do. Use the context of merit in worthwhile work to take your idea up the learning ladder. I hope this posting has helped you see your way forward. Our big ideas don’t have to change the world. They just have to move it along. Expect more from your own energies.